Why we do this…, originally uploaded by EcoSnake. Why we do this… Because we can help folks understand about amphibians and reptiles and about ecosystems.as Scott is doing here. All the rattlesnakes want to do is to be left alone to live their own lives…much the same as do we. When these students touch a rattlesnake (who is in a restraining tube”) they have the opportunity to understand the similarities among all of us. The rattlesnake’s heart beats just as ours” does….We are all part of ecosystems much larger than ourselves..Perhaps the rattlesnake can help teach about that. 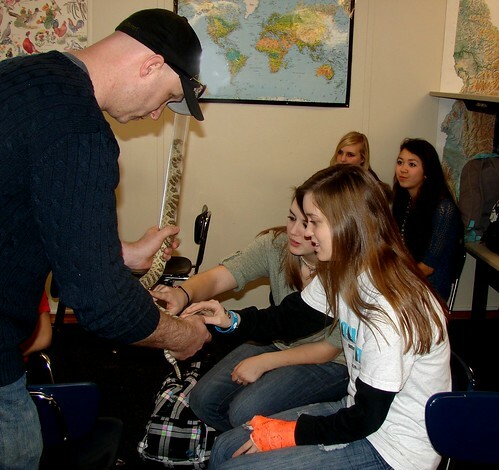 Photo by DaveT at the Boise Schools ecology classes January 31, 2001. .